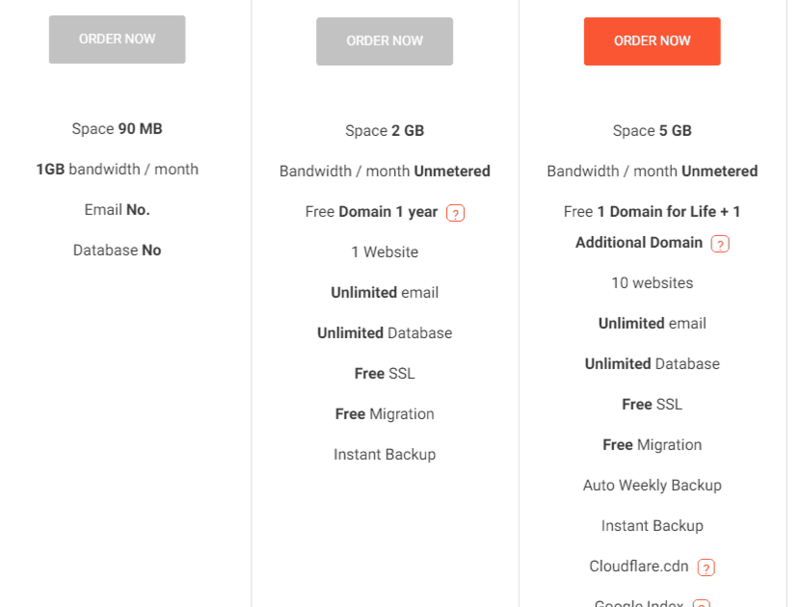 ID Web Host Review 2019: Is ID Web Host a Good Hosting? IDwebhost isn’t just one of the cheapest hosting providers around -- it’s also one of the easiest to manage even for those with little experience creating websites, thanks to their stable servers and easy-to-use website builders. It also has a great support system to get you started immediately and guide you every step of the way. Founded in 2004, IDwebhost is not only Indonesia’s top hosting company, but also the largest domain reseller. Their 75,000-strong customer base is supported by over 100 shared servers. Their offices are located in three different cities around the country, but they are reachable at all times through their website as well as through telephone and WhatsApp. IDwebhost allows you to create websites with unlimited bandwidth and still enjoy one of the cheapest hosting services around. It’s also a great option for those who don’t have any programming knowledge. Their instant website and online store tools ensure that you’re up and running within minutes without having to worry about the minute technical details of creating a website or running an online store. Their servers are located not just in Indonesia, but also in the US. The advanced technology incorporated in these servers is what enables them to offer high-quality, stable hosting at an affordable price. Among their many features, they offer CloudLinux OS with LiteSpeed Web Server, which ensures superior server performance and website loading speeds. To ensure your website performs well in search engine rankings, they’ve also made available their own SEO tools for online promotion. These tools use the latest SEO techniques as well as ads on different websites to bring traffic to your website. Additionally, they offer Google’s G Suite with 30GB of storage, where you can utilize many of Google’s best offerings, such as Gmail, Google Drive, Google Calendar, Hangouts, and Documents. They offer four different packages named Personal, Cute, Awesome, and Fantastic. The Personal package is quite limited, as you get only 90MB disk space and 1GB monthly bandwidth, made worse by the fact that you can’t have any databases or email accounts. Even someone who only needs a static webpage requires an email account in order for people to get in touch with him. Therefore, I find the Personal package a very strange offering. As we move to the Cute package, you get unlimited bandwidth along with 2GB disk space. You can host up to four websites with unlimited email accounts and databases. I highly recommend the Awesome and Fantastic packages as they both offer great features for those who own multiple websites. Both these packages allow you to register two free domains with the ability to host a total of 10 and 20 websites respectively. Don’t forget to watch out for discount offers — they usually have decent discounts on all their packages. IDwebhost has about 20 dedicated customer support staff handling support through live chat, SMS, WhatsApp telephone, and support tickets. They have a Frequently Asked Questions section on their website, which will answer most of your questions both pre- and post-sales. Their live chat is good at guiding you to the right resources in the FAQ section so that you can solve the issues you’re facing, but they’ll also happily do it for you if the technical details are too much for you. I found their customer support quite satisfactory. IDwebhost seems to have the right package for any sort of website owner. Their excellent support staff tops off the high-quality hosting services they provide. Wondering how ID Web Host stacks up against other Web Hosting companies? Enter any other Web Hosting company and we will give you a side-by-side comparison.